The present business environment calls for efficient managers to understand and tackle complex problems in the organization and lead the employee team to achieve good progress. It is possible for a company to outperform its competitors by having a productive workforce. Today, most of the companies choose online assessment tests to aid their recruitment process. The test results are often viewed as effective tools to measure the thoroughness of a candidate’s job skills to gauge the performance level that is expected by the candidate in a given job position. A management competency test often includes personality based questions and assessments are also made based on the response of the candidate in a management situation. Here, the recruiters also judge the ability to defend one and deal with criticism on one’s decision and policies. The tests not only render numerical values or scores, but also provide an in-depth insight regarding a candidate’s collaboration skills, managerial skills, leadership skills, organizational acumen, and management of work and time. It basically represents a whole-person approach and clearly gives an idea about a candidate’s suitability in the work environment. Understanding the governance, company’s structure, setup, and processes. Efficient planning and organizing skills. The assessment test lays emphasis on leadership qualities of a candidate. A recruiter can measure a candidate’s competency with regard to independence, handling of resources, delegating, and communication. The test helps a company to get an understanding of a candidate’s leadership qualities and his/her performance in a management position. Not only in an external selection but also in internal selection procedures, these assessment tests have proven to be useful in choosing the right candidate for a management job position. These are designed by experts and a recruiter can choose from a library of ready-made tests or can opt for a customized test as per the competencies sought for the job position. The tests also follow a scientific bench-marking process and the results produced are valid and reproducible. The proficiency levels sought for the management position might vary and a recruiter gets to choose based on the requirement. It is important for an organization or a business setup to have an efficient, dynamic manager to understand, manage, and utilize the available resources. In order to obtain optimal productivity and substantial financial growth, it is important for a manager to work as a bridge between the employees and the company’s leadership team. 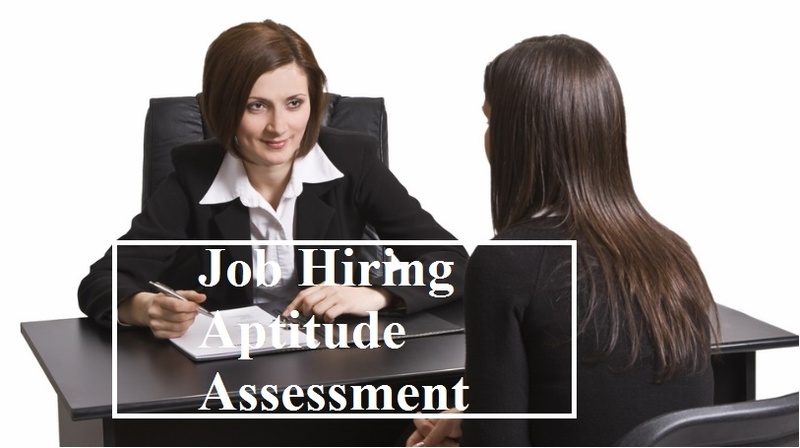 As these are not just Job Hiring Aptitude Assessment or personality assessment tests, the results clearly help the company to judge the performance of a candidate in the job position. Even in an internal selection process, the test results are useful in providing guidance to the employees to advance their skills and increase the productivity in the system. By identifying potential gaps in the pool of employees, a company can frame policies to strengthen the skills of its employees. The cost, resource, and time used to interview each candidate is saved to a great extent with these assessment test.